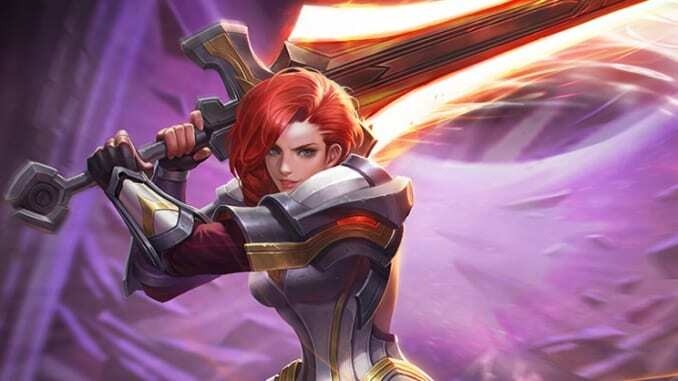 A guide to Arena of Valor's Astrid, the Indomitable. Astrid uses her mighty sword to cut into enemy teams and trash them before finishing whole groups off with her ultimate, Dire Blow. Astrid is a pure warrior hero who rips through enemies with her large sword. She is a strong front liner who can either absorb damage for her team with Bladed Guardian or deal out large chunks of damage with a suite of offensive abilities. These two worlds of offensive and defensive abilities collide when she uses her ultimate, Dire Blow, going invulnverable while she charges a heavy, decisive swing. Durabile – While most of Astrid’s abilities are offensive, her Bladed Guardian passive grants her a shield for four seconds. This can give her some time to push ahead in skirmishes and offers a lot of health over the course of longer fights. High Damage Potential – Astrid’s playstyle offers her the potential to really rough up enemy teams. Each of her abilities directly damages opponents, many additionally upping her damage potential afterward as well. Strong Finisher – Along with her above-mentioned capability for heavy damage, Astrid’s ultimate is a powerful finisher. Dealing additional damage to any with lower health than herself, the ability can cleave giant swaths of health away from targets to finish them off. Low Crowd Control– While able to pack a punch, Astrid doesn’t have many ways to lock opponents down on her own, unlike many other warriors. Without an item like Hyoga’s Edge or Frost Cape, Astrid will have a hard time sticking to a fleeing target. Weak Mobility – With the short-range Fearless Charge as her only movement ability, Astrid can have a hard time escaping from bad fights or catching up to more mobile foes. In addition to its short range, Fearless Charge requires a target to attack after the initial cast to reach its full use. This makes the ability even less reliable when needed for escape. Astrid is best suited to the Dark Slayer lane, her high durability and damage potential matching well against other bruisers who default to the lane. Bully your opponent as often as possible, especially when Bladed Guardian is ready. The shield will minimize your losses when trading and allow you to regularly come out on top. Astrid works well against other melee or short range heroes. She can try to get close to long-range heroes but needs to be good at dodging their abilities. Use Spin Slash to quickly clear minion waves and keep the pressure on your opponents. The attack speed it provides will help refresh Bladed Guardian as well. Start by leveling Spin Slash. It has better damage potential than Fearless Charge and will help much more in clearing minion waves quickly. Take levels of Dire Blow whenever you can. The damage it deals can be immense, and the ability to ignore damage for a short period is invaluable in surviving team fights. Lead in with Fearless Charge to get in close to your enemy, slow them, and lower their armor. Immediately follow with Spin Slash to increase your attack speed while dishing out some additional damage. Pummel them with a barrage of normal attacks, using Fearless Charge and Spin Slash off cooldown to tear away at their health, and finish off with Dire Blow if necessary. If initiating with Astrid, jump in with Fearless Charge before activating Dire Blow. While the damage won’t be at its maximum potential, Astrid will be invulnerable to enemy fire while charging and thereby able to soak a lot of damage at the start of the fight. Furthermore, the damage that the ability does dish out will help start the fight off in your team’s favor. Use Fearless Charge to get on the enemy’s back line and tear down squishy damage dealers. If an enemy retreats, take advantage of Fearless Charge to chase them down and prevent their escape. Fearless Charge can be used to rush away from fights when needed. It can also be used to pass through walls should she be close enough to them at time of casting. Bladed Guardian – Passive – When Astrid’s HP falls below 80%, she gains a shield that absorbs 500 (+75 per level) HP for 4 seconds. The shield effect has a 24-second cooldown and will be reactivated when Astrid takes damage again. Cooldown is reduced by 3 seconds every time Astrid hits an enemy hero with an ability or normal attack and by 1.5 seconds every time she hits an enemy minion or monster. This allows Astrid to make great trades with her enemies. Regularly jump on your opponent with Fearless Charge and trade some blows before backing off to slowly whittle away their HP as they try to lane. The shield’s cooldown is lessened by Sage buff. Spin Splash – Astrid swings her mighty sword around, dealing 200/240/280/320/360/400 (+1.2 AD)ˀphysical damage to surrounding enemies. If she hits an enemy hero, Astrid’s attack speed will increase by 20% and an additional 5% for every other hero hit for 3 seconds. Astrid’s first ability makes her great at clearing minion waves and putting pressure on her lane. Spin Slash is much stronger in team fights, the additional attack speed raising Astrid’s damage potential as well as lowering the cooldown of Bladed Guardian. Fearless Charge – Astrid charges forward, dealing 60/90/120/150/180/210 (+0.5 AD) physical damage, reducing enemy movement speed by 50% for 1.5 seconds, and decreasing target armor by 30% for 4 seconds. The speed of her next normal attack is also buffed by attack speed bonuses. The attack speed bonus will be applied to the charge speed of the next normal attack. If an enemy hero is hit, the cooldown of Fearless Charge is reduced by 1 second, but this effect does not stack when multiple heroes are hit. Fearless Charge is Astrid’s best way to get close to enemies. As a melee hero, Astrid can easily be zoned by skilled ranged heroes. The extra damage and armor reduction occur when Astrid’s attack connects. Enemies don’t have to be passed over by the leap to be affected. Fearless Charge can be used to pass through walls. Items like Frost Cape and Omni Arms synergize well with Fearless Charge, the extra damage proccing when the attack connects. Astrid’s ultimate can devastate the entire enemy team when timed and positioned properly. When readying her ultimate, Astrid moves incredibly slowly. Mind your positioning so that your enemies don’t simply walk away from your attack. Astrid’s abilities can be baited out and be punished accordingly. Try to get near to Astrid and back off at the last second to bait out her abilities. You can kite and poker her very easily when her gap closer is on cooldown. Astrid’s ultimate has a cast time. Don’t try to hit her as she will be invulnerable against any type of damage. When she casts her ultimate, use the charging time to get out of range, either back backing away or going behind her. Astrid’s passive grants her a shield when her hp falls below 4/5 of her health. Try to trigger the shield and then back off when it is active. Hit again when the shield is on cooldown. If going purely offensive with Astrid, we suggest taking Onslaught, Assassinate, and Skewer. When instead wanting to go all in on her defense, running Indomitable, Benevolence, and Crusader is effective. Dealing with Tank heroes is not an issue for Astrid, especially early game. Most tanks have weak attack damage, so she can safely bully them with her normal attacks. The armor pierce from Fearless Charge will make them even easier targets as well. That said, tanks should generally be ignored while there are squishier targets available. Astrid can do well against other warriors, Bladed Guardian offering her the ability to make advanageous trades with them early game. She will need to be careful, however, as many can reach higher heights when it comes to either attack damage or defensive power, making skirmishes much harder. Astrid can take on many assassins after getting a few items. Their initial burst can be avoided if Dire Blow is timed well, allowing the girl to completely ignore their damage. Without their initial burst of abilities, Astrid will have the upper hand and can do well in a prolonged fight. Since mages are also ability-based heroes, try to lure out their abilites and dodge them before charging forward. Harass them with your normal attacks and abilities to chip away their health before finishing with Dire Blow when necessary. Once Astrid can get up close to a marksman, she will have an easy time dealing with them. Her own burst damage will be able to rip through their meager defenses while Bladed Guardian keeps her up through their attacks. They are high priority targetes that should be dealt with as soon as possible, especially later in the game. Support heroes are a pain for Astrid due to their recovery and debuffing abilities. Their wide area of effect abilities can make them hard to approach as well. Astrid will need to be careful to avoid their abilities when wanting to harass a support.